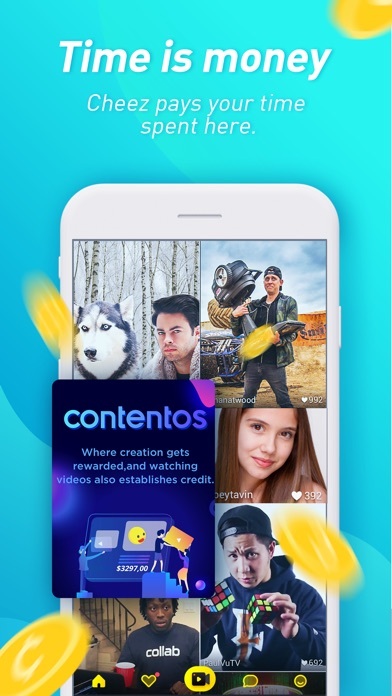 Cheez & Contentos ■ Post videos: You can get rewards if your videos generate enough views, likes, comments and shares. 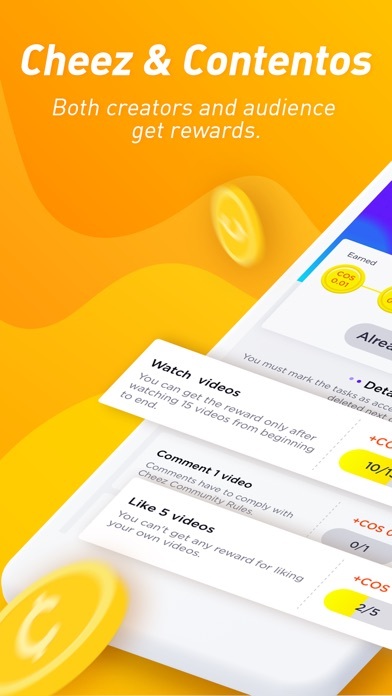 ■ Watch videos: You can also get compensated as audience by watching, liking, commenting and sharing other people's videos. 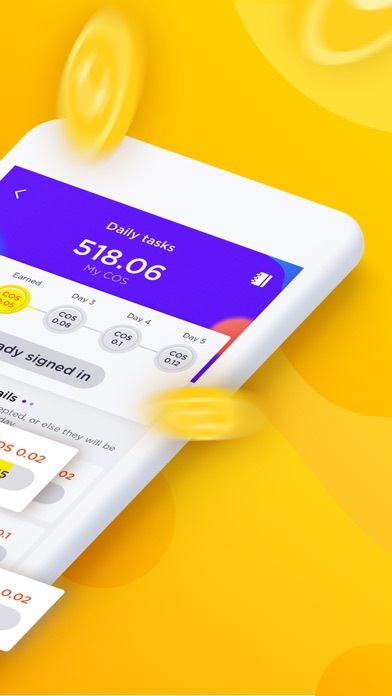 ■ Sign in: You can earn rewards by signing in every day. Create: Cheez is an easy-to-use video maker ■ Editing tools allow anyone to easily trim, cut, merge, and duplicate video clips ■ Stitch together multiple memories and make the best holiday movies - bring them to life with text and drawing tools ■ Live filters are constantly being updated for every occasion ■ Dance, lip-sync, or music videos... It's all here Discover: Cheez is a fun community that will make you smile ■ Fun videos will keep you entertained for hours ■ View a personalized feed of videos created by other Cheezers ■ Videos that make you smile include ones about comedy, cooking, makeup, pets, pranks and fashion Share: Don't just keep your videos inside Cheez, share them with the world ■ Share your videos inside Cheez and become a star! 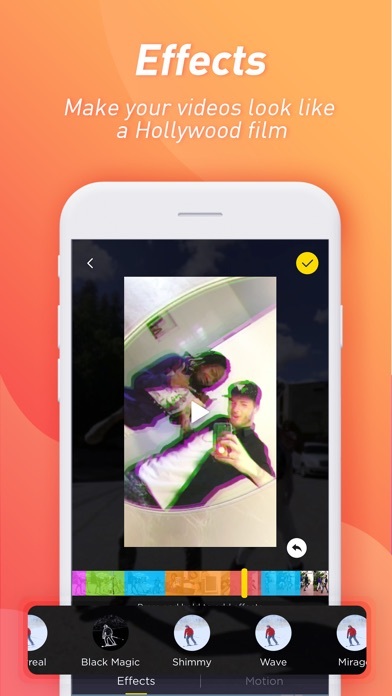 ■ Share your videos to other apps like Instagram, Facebook, Twitter, YouTube, Musical.ly, Tumblr, Pinterest, FB Messenger, WhatsApp, KIK, or LINE - even across e-mail and SMS ■ Celebrate friendships, relationships, anniversaries, birthdays, holidays, and all your memories with the people you love Connect: Cheez provides daily battles, challenges, Dance Off ■ Post a topic and start a battle, and see which side gets more votes and videos ■ Join a challenge to show your talent and creativity ■ Dance Off, the world's first mobile dancing game, brings a lot of fun and challenges Top video categories include: ■ Comedy, Prank, and Clever Editing ■ Talents (singing, dancing, magic, guitar, transition, and more) ■ Lip-syncing ■ Fashion & Beauty ■ Vlogging ■ Animals - especially funny and cute dogs! I can't log in again with facebook? Cheez is a great social platform, but waiting for 9 days for support to respond without any reassurance is a bit sad. I made an account maybe 2 years ago, and now, wanting to recover it and delete some things I put on it, I can’t in any shape or form. There’s no password recovery feature, no way to type in your username and try to fish it out, and even worse, no functional support system from my end. Don’t mean to be hash, but I’ve been trying for a while to get that account back. It's basically A KNOCK OFF TICK TOCK OR MUSIC.LY OR WHATEVER YOU WANNA CALL IT.SO ITS KINDA BASIC WHEN I SAW Advertisement for the app it looked way more fun I didn't start it yet but I already had the feeling it was going to be bad so I deleted the app some might enjoy it but everyone has their own opinions. 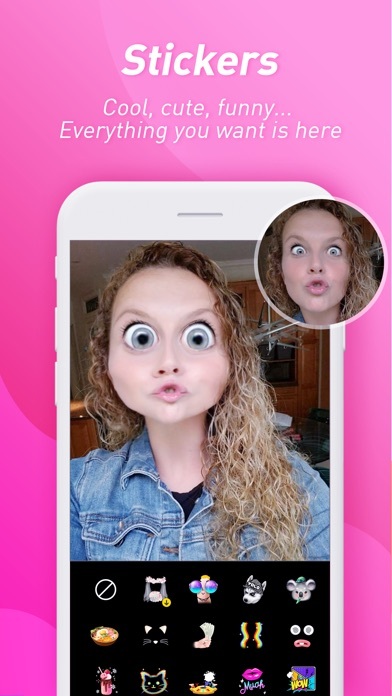 Guess what?THIS APP.IT PRETTY MUCH TikTok. I have a bunch of reasons to love this app. one of them is because it’s easier for people to notice you. Whenever I’m on Tik tok it’s getting harder for people to notice you and it’s hard to get more likes. I highly recommend this app (Cheez).